Welcome to my blog which focuses on Canadian architecture, landscape, design, products, and real estate. If you're new to it - most of the articles are researched and written by students and recent graduates who are passionate about the many facets of shelter - but my own healthy obsession in all manners of housing and home, including posts on Toronto where I make my living as a realtor - do make an appearance on occasion. Like today, where I'm going to spotlight Toronto's Bay & Gable Victorian housing stock and discuss the finer points of this century-old architectural style. This piece was originally featured on my company site - Urbaneer - which promotes character dwellings, loft conversions, architect designed homes and low maintenance living, in Toronto's original 42 'village' neighbourhoods. For lovers of architecture, the City of Toronto provides a treasure trove of visual interest with its housing stock. Take for instance the prevalence of the charming Gothic Revival Cottage, or the wealth of Edwardian Residential Architecture In Toronto. 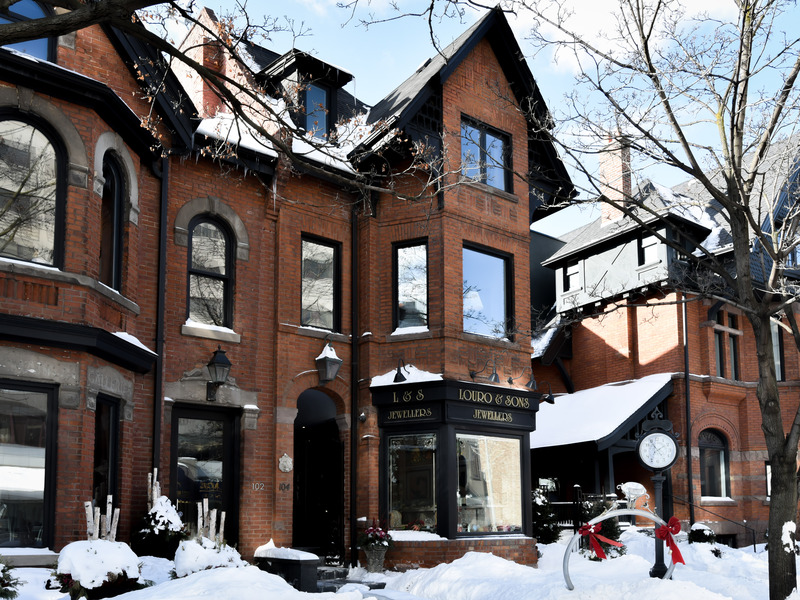 Another common style that is both beautiful and historically fascinating is the Bay & Gable style home, which dot many streets in Toronto’s storied neighbourhoods. 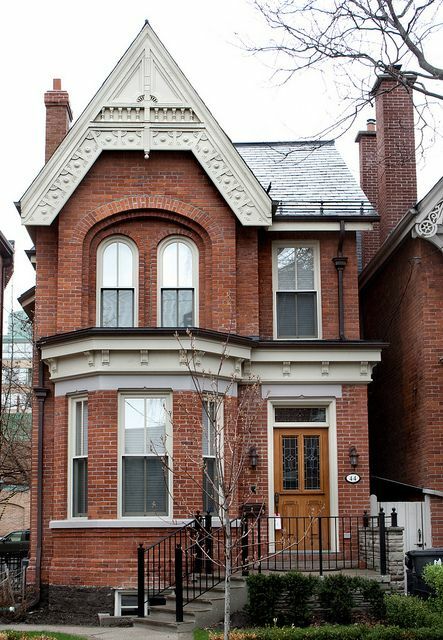 The Bay and Gable was one of the more common styles in the Victorian era in the City of Toronto. Their tall and narrow design lent itself perfectly to make the most of the lots in Toronto - that were narrow and deep. You’ll find them in numerous neighbourhoods as row and semi-detached housing. There are detached Bay & Gable homes, but they are more rare. These homes are immediately recognizable by their iconic gables that are placed atop immense windows. While everyone appreciates natural light in their home, these large windows were a necessity given the Bay & Gable design. Given the pronounced depth typically of these homes, the large windows allowed light to make its way through the entirety of the home. Air circulation through the narrow home could be challenging, and the ample window space at the front of the home was meant to ventilate and circulate most effectively. It wasn’t just about keeping the indoors comfortable; it helped to divert some of the odours that city residents were faced with during the era (like burning coal and gas fumes), living in a tight neighbourhood. Even more light was ushered in through trademark transom windows that were usually placed over the front door. While most often built with brick, a variety of different materials was used. On the exteriors, some homeowners trying to save money would have a brick façade on the front with clapboard or shingle siding elsewhere. 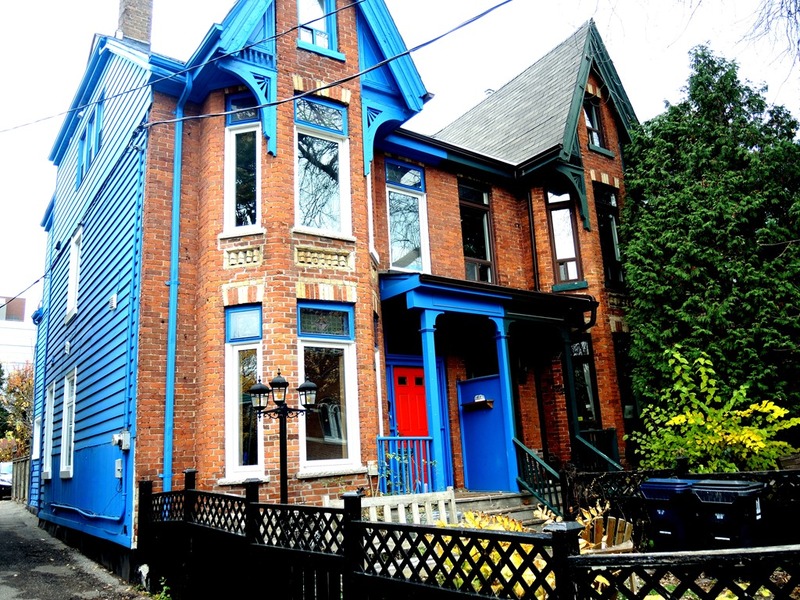 Here are two examples of Bay & Gable homes in Toronto where siding has been added, but, more noticeably, the owners have tried to introduce bright colours to the facade. It's not fo us - we're purists - but what do you think? Their tall design also let homeowners maximize the space of their home, while avoiding paying hefty property takes. 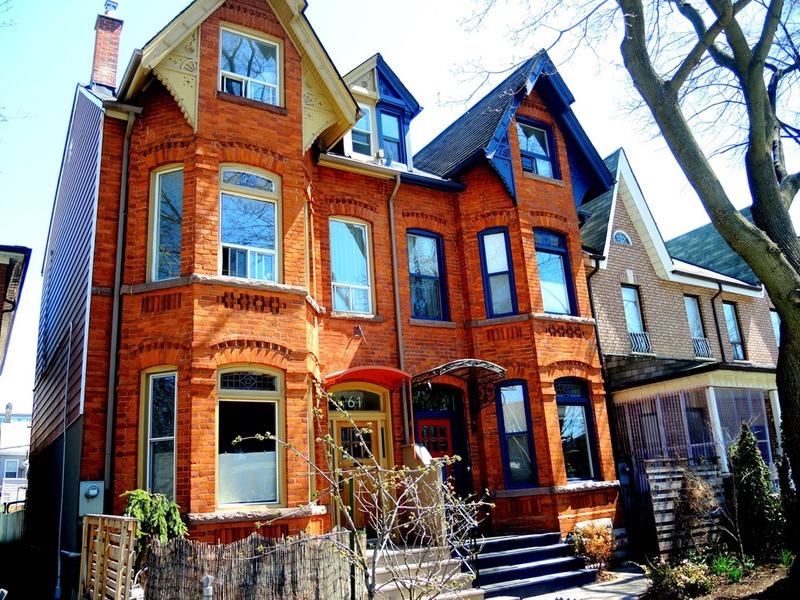 During the Victorian era, property taxes in Toronto were based on the width of a lot’s frontage, so instead of building out, homeowners built up, often three stories high with soaringly high ceilings (often 10+ feet high). The gables play role in design diversion, drawing the eye up to a pleasing focal point, rather than revealing the narrow size of the home. Inch for inch, the Bay & Gable design offer an awful lot of visual interest compared to other housing designs. That’s because while they are smaller in size, the level of detail in the design and décor is opulent and impressive. The interior floor plan was generally the same, with variations based obviously on the size. The traditional layout featured formal sitting and dining rooms at the front of the house, with the kitchen at the rear in a separate zone for ventilation. The bedrooms were located upstairs, with the more important household members sleeping near the large bay windows and transoms to receive the most natural light and air. In the attic levels were additional sleeping quarters, allocated either to children or household staff. While much of the physical layout was standard, the intricate décor was often very personal and ranged widely depending on homeowner taste (just like today). There was a great deal of flexibility with the style itself that really allowed homeowners to embrace the style while putting their own personal stamp on their home. For example, the style evolved to reflect a half-bay that also had a balcony that stretched across the top storey. Double bay homes were larger and needed larger lots to accommodate the extra width. 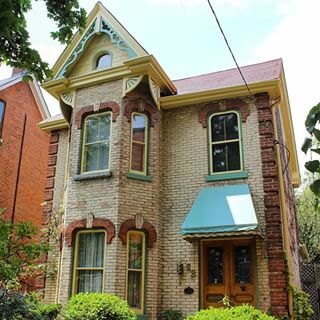 Our new listing A Signature Commercial/Residential Victorian On Avenue Road In Yorkville Village, offered at $3,858,888, is a great example of how the Bay & Gable style utilized height instead of depth; its three levels plus finished basement are completely renovated, which adds up to very sizable residential and commercial spaces! The owners have restored the charm of the historic architecture, and added convenient modern upgrades! Curious to read more about the history of this iconic style that is so deeply rooted in Toronto’s housing history? Click to read this article from Hoss Magazine, this piece from Blog TO, or this piece from Mirvish+Gehry! ~ Posted by Steven Fudge, the purveyor of houseporn.ca and proprietor of Urbaneer, a division of Bosley Real Estate Ltd., Brokerage.